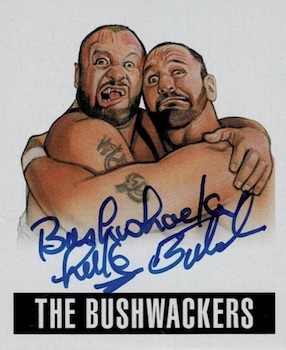 Billed as one of the best-ever wrestling card sets released by Leaf, 2018 Leaf Legends of Wrestling highlights top WWE stars, debut signers and even some MMA fighters. Every box contains eight autographs and random cases feature original art as toppers. Although this brand is new, Leaf has a history of wrestling sets that have built up a following with collectors. 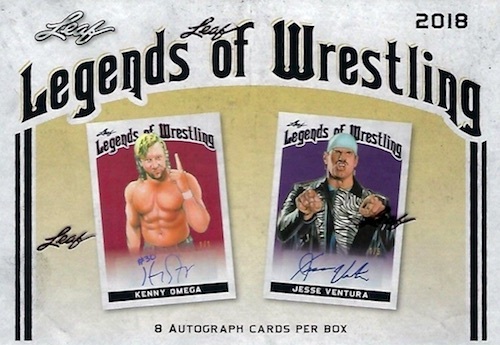 Among the Autograph standouts in the 2018 Leaf Legends of Wrestling checklist, Leaf boasts the first certified, pack-issued autograph card for Jesse "The Body" Ventura. There are also low-numbered parallels and Dual Autograph options. 2018 Leaf Legends of Wrestling includes full-size designs under the Legends of Wrestling brand, as well as the Leaf Originals mini style. Although not exactly expected from a wrestling set, on-card autographs are available for UFC stars like Paige VanZant and Royce Gracie. There are also other MMA subjects. Based on Leaf's comments from Twitter, it appears that this might be their final standalone wrestling set. Buy 2018 Leaf Legends of Wrestling autographs on eBay. PARALLEL CARDS: Silver #/25, Green #/15, Gold #/10, Purple #/5, Red 1/1. *DYNAMITE KID PARALLELS*: Silver #/15, Green #/10, Gold #/7, Purple #/5, Red 1/1. *JIMMY HART PARALLELS*: Silver #/10, Green #/7, Gold #/5, Purple #/3, Red 1/1. 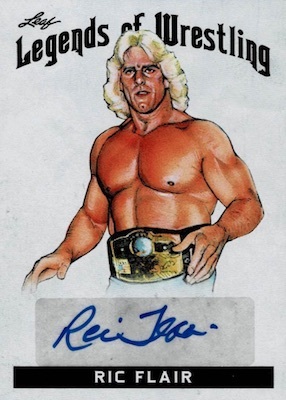 *RIC FLAIR PARALLELS*: Silver #/5, Green #/4, Gold #/3, Purple #/2, Red 1/1. PARALLEL CARDS: Silver #/15, Green #/10, Gold #/5, Purple #/3, Red 1/1. 35 cards. Design year noted. BASE PARALLELS: Yellow #/99, Blue #/25, Red #/10, Black 1/1. BASE MMA PARALLELS: Yellow #/50, Blue #/25, Red #/10, Black 1/1. ALTERNATE PARALLELS: Yellow #/25, Blue #/10, Red #/5, Black 1/1. *Chyna (Base/Alt), Ryan Shamrock (Alt) only in parallels; Bob Sapp only in Blue/Red parallels. View the 2018 Leaf Legends of Wrestling checklist spreadsheet. 2018 Leaf Legends of Wrestling Factory Sealed Hobby Box 8 Autographs!